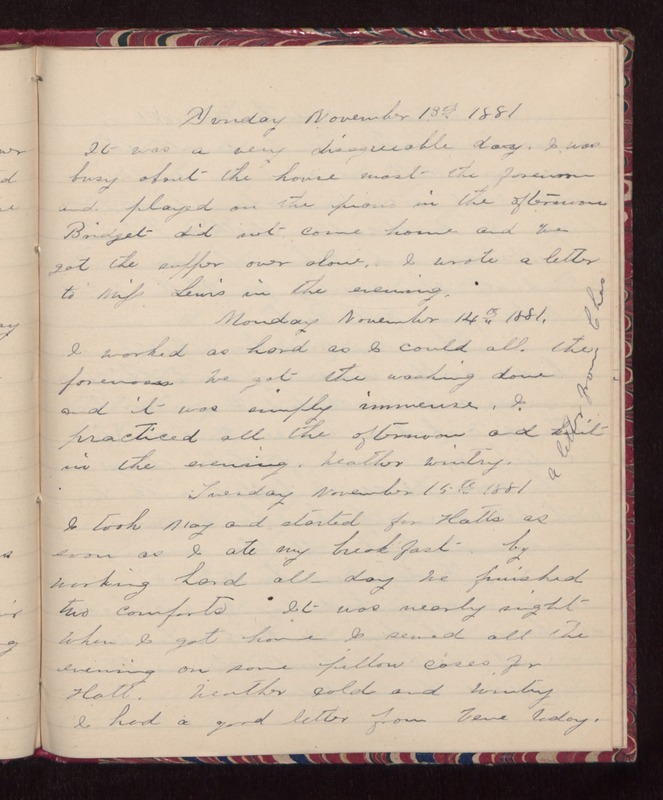 Sunday November 13th 1881 It was a very disagreeable day. I was busy about the house most the forenoon and played on the piano in the afternoon Bridget did not come home and we got the supper over alone. I wrote a letter to Miss Lewis in the evening. Monday November 14th 1881. I worked as hard as I could all the forenoon. We got the washing done and it was simply immense. I practiced all the afternoon and knit in the evening. Weather wintry. A letter from Chas Tuesday November 15th 1881 I took May and started for Hatts as soon as I ate my breakfast, by working hard all day we finished two comforts It was nearly night when I got home. I sewed all the evening on some pillow cases for Hatt. Weather cold and wintry. I had a good letter from Vene today.